During the heyday of the Milwaukee Road, Montevideo was the location of a 27-stall roundhouse with associated shops and support facilities, and a wonderfully designed 12-track yard. The yard was a busy place as trains were made up and broken up here, crews were changed going from Minneapolis to Aberdeen, S.D., and back. A group of area model railroaders who were members of the Milwaukee Road Heritage Center, many of whom were also members of the Minnesota River Valley Division of the National Model Railroad Association, began planning an HO-scale model railroad starting about 2005. The group decided to model Montevideo as it was in the early 1950s when the railroad was prosperous and there was a lot of train traffic through Montevideo. Construction of the two-level layout began in 2007. 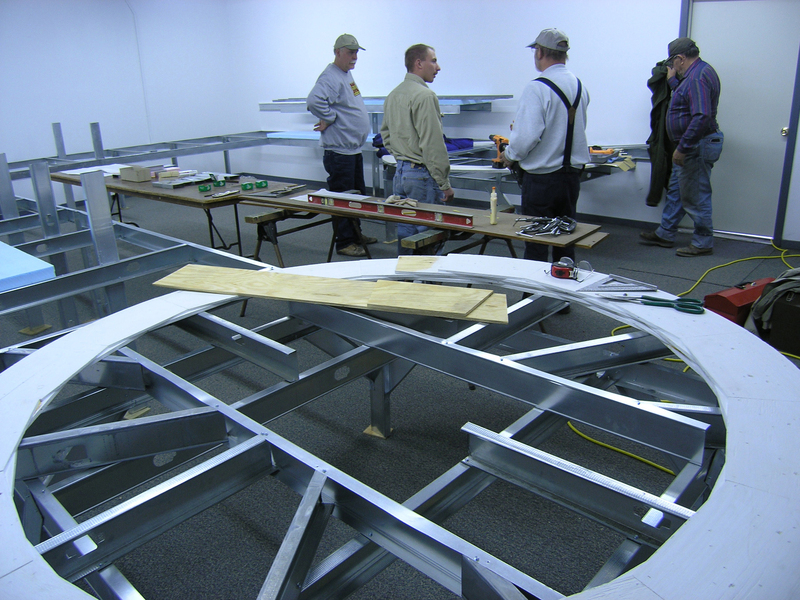 The members of the Minnesota River Valley Division voted to officially support the project as a division activity, and several division members have put in many hours of work helping build the layout. The layout is built with metal 2x4 studs and 2-inch styrofoam insulation to minimize problems because of fluctuation in humidity and temperature. Using track diagrams of Montevideo, a track plan was roughed out by MRHC/MRVD member Brian Wordes with help from MRHC/MRVD member John Givan. The layout was designed for ease of viewing by the public. The two-level layout is centered around a condensed version of the Montevideo yard as it was in late 1953 (we needed to be able to run a Super Dome on the Olympian Hiawatha) and extends to Wegdahl on the east and Watson on the west (both at the bottom of a helix on the lower level). A large staging yard on the lower level provides ample storage for cars and staging for trains. Track is Atlas Code 100 with Peco Insulfrog switches. Mainline switches have switch machines installed. Yard tracks are hand-thrown. Track is laid on Woodland Scenics foam road bed to deaden sound as much as possible. Some original buildings, including the depot and sand house still exist. Building mock-ups of the depot, the beanery, the freight house and several elevators have been made by MRHC board member Wayne Spiess. Eventually, replicas of all the buildings will be built using photographs and plans obtained from the archives at the Milwaukee Public Library or wherever else they can be found. An Easy DCC wireless control system is used to operate the layout. All locomotives have sound systems so they look and sound like the real thing, and freight and passenger cars will be as prototypically accurate as possible. The layout is open for the public to view during the annual Fiesta Days celebration in June. Private tours have also been given to school groups. Tours may be arranged by contacting any MRVD board member or John Givan. The Milwaukee Road has been gone since 1985, but a part of it lives on in the model railroad building at the Milwaukee Road Heritage Center. If you would like larger and more pictures of the model railroad click on this link.